Chuck Queen pioneered this conversion on his boat Barnstormer. War Canoe did the conversion after they crunched their rig on the hoist and went from a double spreader rig back to a single spreader rig. Cost is based on the price of your new spreaders and rod. If you have this done professionally by a rigger, it will cost more. Expect to pay several hundred on the spreaders, and around 1000 dollars on the rigging. In the Seattle area, Spar Tech Co. (425) 867-1343 can supply the rod cut to length. Step 1: Order the new capshrouds for your boat in the appropriate length. If you are not an engineer by trade, we can help you figure out how much extra shroud length you’ll need. If you measure your current spreader length (mast edge to the centerline of the shroud), current shroud length (pin-to-pin), how much additional height you can get with the new shrouds, we can calculate the new length you need. This is Navtec dash 4 rod rigging. It is expensive, its important to get things right the first time. Step 2: Order 37 1/2 inch spreaders to fit your current spreader mount. Buzz Ballanger can take existing ones and lengthen them by request. Step 3: Pull the mast and strip the old rigging. Use any old hardware you want, but this is a fine time to replace turnbuckles etc. if you are still sailing on 20-year old gear. When we did this conversion on Orcrist, we replaced some hardware, but kept other hardware. We also took the time to replace the forestay at the same time. Optional: You can still use your old capshrouds for another boat, if they have servicable life in them, or cut them into a newer set of lowers. Step 4: Drill holes for the new capshrouds at the top of the mast, according to your measurements. You can elect to cover the old holes with a small plate, or not. Optional: This is a good time to do maintenance on your halyard sheaves. Step 5: Assemble the hardware for the new shrouds. 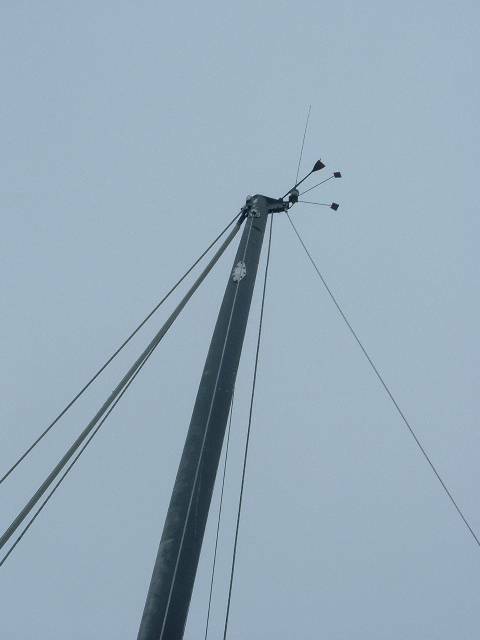 Step 6: Put your mast back up and go sailing! Enigma has cap shrouds raised to the masthead. Note the elliptical patch above where the cap shroud was originally located.